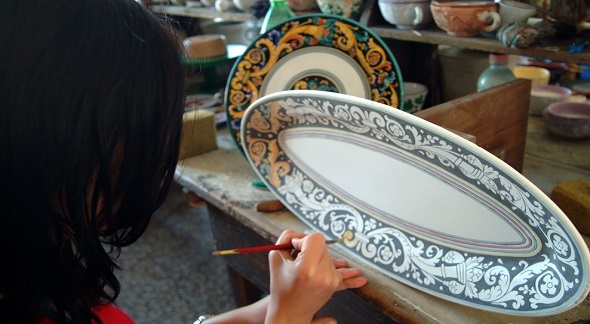 Deruta is famous as homeland of a pottery and ceramics production among the most beautiful and precious of Italy. The cohesion between Deruta and its ceramics is indissoluble and it is the main characteristic of this little town. This production has its roots in the most ancient past of Deruta, forging its own historical identity. When are the ceramics of Deruta born? The documents attest that the first ceramics of Deruta were realized in the Medieval Age. Official documents establish that ceramics of Deruta have been produced since XIIIth century, although we have reasons to believe that this such of activity started one century earlier. Anyway, at the end of XIIIth century, Deruta produced so many ceramics that it could pay the charges imposed by Perugia in vases instead of money. At the end of XIVth century, Deruta had a position of "regional" producer of pottery and ceramics, and was - so to speak - an exporter. In fact, according to evidences, as early as in 1358 Deruta exported more than one thousand vases of ceramic to Assisi, the homeland of Saint Francis, a place where the need of these products for using or for the pilgrims as souvenir was increased. The wealthiest period for Deruta was without any doubt the XVIth century, when its artists took part, althought with reflection, to the climate of artistic and cultural revolution of the Renaissance. 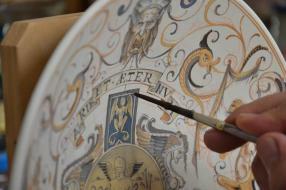 It is during this period that the famous "Raffaellesco" ornament becomes popular, symbole of the Deruta pottery production. The term "raffaellesco" is coming from one of the big stars of the Renaissance: Raffaello. At the beginning of the century, Raffaello painted a serie of fresco with the decoration of a Loggia in the Vatican and some of its patterns were "grotesque": a fantastic composition of plants, animals and men. Ceramists of Deruta, even if they had not seen by themselves such fresco, knew them thanks to prints and the "grotesque" ornaments started to be painted on their pottery. From the end of the XVIIth century until the XIXth century Deruta suffered from the general political and economic crisis and also from the growing competition of other places of production, such as for example Castelli d'Abruzzo. 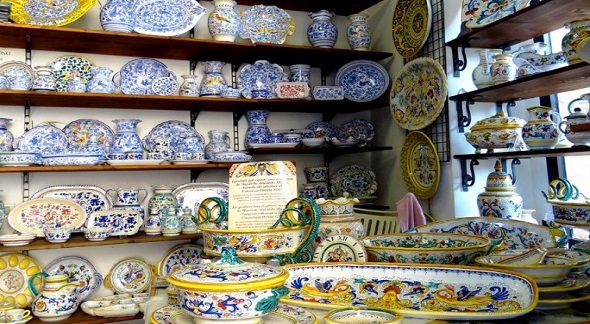 We have to wait until the second half of the XIXth century to see a new birth of the interest for the "Renaissance" majolica and therefore for the Deruta ceramics Therefore it is absolutely necessary, for who is so fortunate to visit Umbria, to stop in the enterprises and in the shops specialized in that kind of production. Those who, on the contrary, can not profit now from a holidays in this region, will find a valid online shop with a large choice on our site, in such a way that besides the fact that they can not personally discover the secrets of the art of modeling and cooking from the clay, they can at least admire it directly in their own houses. During your holiday in Umbria, not to miss an over-stop in Deruta to visit the laboratories of these productions. To explore these factories is a charming experience, expecially if you will participate in the ceramics workshops discovering the secrets of clay modelling and firing art. 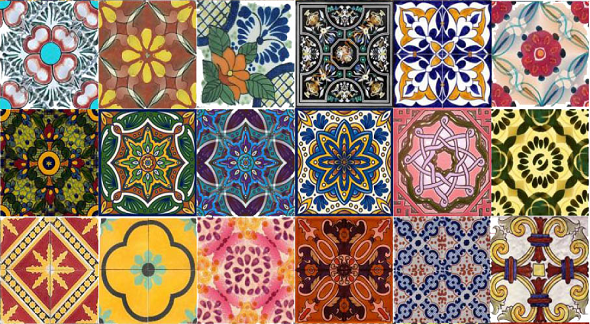 participation in the workshop of traditional decoration of ceramics (at the end of it, the work will be at your disposal).